Hold onto your bonnets - a "dark" and "adult" TV series of Pride and Prejudice is being made by the people behind Poldark. It will be the sixth adaptation of the classic novel by Jane Austen, but scriptwriter Nina Raine, who's best known as a playwright, hasn't watched any before. This is also the first time ITV will be showing the period drama. It comes 22 years after the last TV dramatisation, starring Colin Firth. Raine, whose play Consent was seen at the National Theatre last year, has been commissioned to adapt the book by Mammoth Screen, who also made ITV's Victoria. She told Radio Times magazine: "Pride And Prejudice is actually a very adult book, much less bonnet-y than people assume. "I hope I do justice to Austen's dark intelligence - sparkling, yes, but sparkling like granite." The book tells the story of the Bennet sisters as they search for husbands, with its famous opening line: "It is a truth universally acknowledged, that a single man in possession of a good fortune must be in want of a wife." 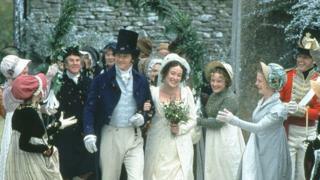 Before the 1995 version, which featured Firth as Mr Darcy and Jennifer Ehle as Elizabeth Bennet, the previous time it had been on TV was in 1980. There's also been a 2005 film, starring Keira Knightley, and last year's Pride and Prejudice and Zombies. Damien Timmer, managing director of Mammoth, said it was time to bring Pride and Prejudice into the 21st century. "Every generation needs its own adaptation of this perfect novel," he explained. "In this age of the box-set - with audiences loving to binge on complex, serialised dramas - it feels absolutely right to reassess the great classics." The social media reaction from fans wasn't all positive though, with Irish Times journalist Emer Sugrue saying: "No one wants a gritty reboot of Pride and Prejudice. No one." And the Evening Standard's TV critic Toby Earle was feeling a touch of deja vu at the news, writing: "What a great break for one of our greatest living authors to have her little known novel #PrideandPrejudice adapted for TV." Last month, Andrea Leadsom had accidentally called Austen "one of our greatest living authors". Others listed the books they'd like to see adapted for a change instead of the Jane Austen classic - with many mentioning Northanger Abbey. But some were more hopeful about the series. Tom Sutcliffe, presenter of Radio Four's Saturday Review, said: "I actually think it'll be very interesting to see what Nina Raine does with Pride and Prejudice. *ducks*", adding: "I'd rather she'd been asked to write something original for television. But maybe that comes next."